Real Men Don’t Eat quiche, they eat Quiche! “Real men don’t eat quiche”! Yeah, right, not when it is my quiche or should I say the Bouchon quiche. I really do not know where that reputation came from. Probably from the tiny dainty pieces of puff pastry painted with a substance that might’ve been egg at some point and frozen in boxes that you can pick up at Sam’s or Costco. Yes, these poor little imitations still pop up at an “eh-derve” party here and there, but these are not quiche! Neither are those ½ inch thin tarts that are sold and made by many. You need 2 of those tarts, yes tarts not quiche, to get full. Is that possibly why “real men do not eat quiche”? Do they not meet the criteria of filling, delicious and rich that any man looks for in a meal? If you believe those Hungry-Man commercials, they don’t. Well, I doubt anyone can make this argument against the quiche from the Bouchon book. 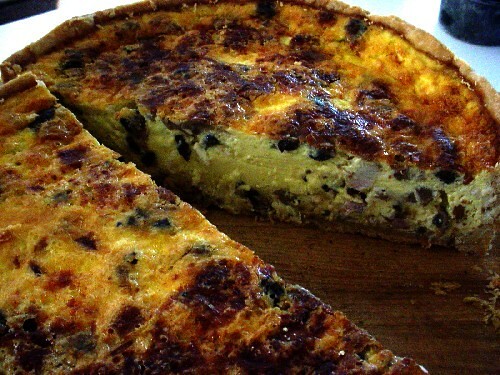 This is a real quiche, 2 inches thick and chuck full of eggs, cream, milk, meats and other goodies…oh yes and cheese. Take that Hungry-Man! I’ve made the Bouchon recipe numerous times and the first few times were bad experiences. This thick quiche will leak if not properly made, and in all honesty it is one of the most challenging cooking experiences I’ve had. A small crack can turn into a much bigger one once the custard is poured in and disaster ensues. When you get the hang of it though, this is one glorious piece of pastry, delicious and impressive. I have not had a leaky quiche in quiet sometime. Remember, work fast, keep the dough rolled thick, and fill when still hot/warm. Here is my adaptation of the Bouchon recipe. My custard has more eggs and less dairy because I like the more curdy texture rather than creamy. I also love this bacon mushroom filling, but feel free to improvise. Make the pastry: in a food processor, combine one third of the flour with the salt and pulse a couple of times. Add the butter in increments until all of it is incorporated ending up with a paste. Add the rest of the flour and the ice water and pulse until you have a nice smooth dough. Form the dough into an 8 inch disk, wrap in plastic and refrigerate for about an hour or up to 48 hours. This can also be frozen. Make sure the dough is pliable before rolling though. Lightly oil the inside of the cake ring, place it on a baking sheet lined with parchment or a Silpat. Roll the dough into a ¼ inch thick round. It should be large enough to line the ring and have about a ½ inch overhang. But DO NOT roll it too much thinner than ¼ inch. Roll the pastry on a rolling pin and lay it in the ring gently, do not pull and tug on it as you let it rest in all corners. Fold any overhang on the outside of the ring, it will help keep it in place. Save any extra dough, you might need it. Refrigerate for 30 minutes till it sets. Preheat the oven to 375F. Line the unbaked crust with an oiled parchment paper and fill with pie weights or beans (I use beans). Bake for about 30-40 minutes till the edges are brown. Gently remove the beans and the parchment, patch up any small cracks with the reserved dough and return to the oven for another 10 minutes or until the inside and bottom are lightly browned. Make the filling while this crust blind bakes. Make the Filling: Saute the bacon in a large nonstick skillet over medium heat till the fat is rendered and the meat is lightly crisped. Remove to a plate and sauté the mushrooms in the bacon fat, till lightly browned. Add the shallots and onions and cook everything till the mushrooms exude all their liquid and the onions are soft. Whisk in the butter and cook for another minute. Add the bacon to the pan and if needed add a little salt. You will also be seasoning the custard so don’t add too much. Heat the milk and cream till a skin forms on the surface but do not boil them. Remove from heat. Crack the eggs in a large bowl, add the salt, pepper, nutmeg and whisk till smooth. Slowly add the milk mixture and keep on whisking till everything is combined. Assemble the quiche: Do this when the pastry and custard are still hot/warm, do not let them cool down. This will help the filling cook and set faster rather than get the pastry soggy and leaky. Make sure the shell has no small cracks, pay particular attention to the corners. If it, does patch them with pieces of reserved dough. Leaving the shell on the baking sheet, place half the bacon-mushroom mixture in the bottom, top it of with a third of the cheese, and gently pour in half the custard. Repeat with the remaining filling, half of the remaining cheese, and the rest of the custard. You might want to place this in the oven then adding the last cup or so of custard to avoid spilling during transfer since it will be filled to the brim. Top with the rest of the cheese. Bake for about 70 – 90 minutes, until it is set and nicely browned on top. Cool to room temperature and then chill overnight. 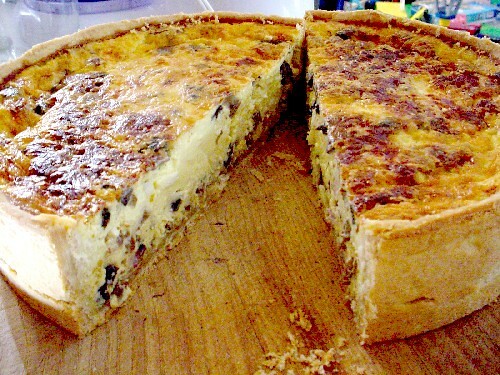 When ready to serve, the quiche should be set and can be handled easily. Simply use a knife to cut the extra overhang and slide the quiche out of the ring. Slice and heat the slices on a baking sheet in a 375F oven till heated through. Enjoy. Damn, I need to make me one of those. 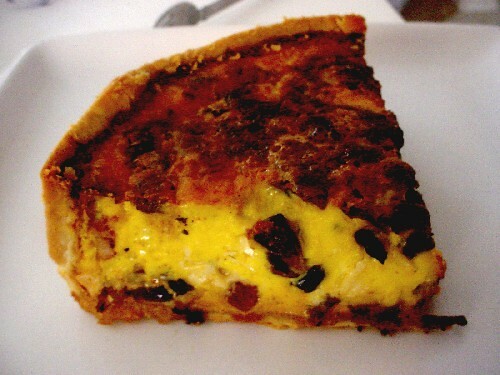 Thats a serious Man-Quiche. yeah, real men eat quiche if it is done like that. and everything is better with bacon. i just had a quiche with fresh cayenne peppers from a recipe i found online. it was awe inspiring, and the caption on the web site said “real men eat this quiche” and it was right. yummy. Cool post. I know it’s dated, but I just tried the Bacon and Onion Quiche from the cookbook and met with disaster. Full disclosure, I didn’t weigh the flour, and used the recommended 2 cups, so I think my dough ended up closer to 1/8 inch. The real problem was that I had a crack after the second bake. I tried to patch it, but the crust was so flaky I only ended up making it worse. I did the best I could, and ended up with custard all over the bottom of my oven. Any tips on patching after the second bake without destroying the crust? I honestly don’t have much more to add beyond what I already wrote. It needs a bit of practice to get this one right. 1/8 of an inch is a bit too thin though. Work fast, make sure the butter is well incorporated, keep the dough cold and don’t roll it too thin. For readers in other countries… what does ‘1 stick of butter’ weigh? 1 stick of butter is 1/4 of a pound or about 113 grams. Hope this helps.